The LouvreMASTER™ system has been successfully tested for compliance with AS2047 (wind and proof load). 1200mm wide door panel will withstand 2000Pa Serviceability at 1/250 deflection and proof tested to 3000Pa. Blades are 88mm by 14mm oval shape. 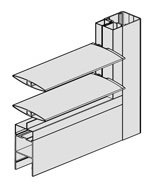 The pitch for the blades can vary from 60 to 80mm depending on panel height. The blades can be clamped in any position between open and closed with the use of a activation handle.